Pixabay / QuinceMedia / Pixabay License President Macron wrote the open letter entitled "A European renaissance"
The open letter is to be published by several media outlets in France, and is also online on the official Elysée website (in French) and in English (here). President Macron's official Twitter account has also tweeted the letter translated in most major European languages. The letter calls for a “stronger, more united continent”, which would offer “more protection, more freedom, and more progress”, and said that "since the Second World War, Europe has never been so necessary". The President called for a “reset of the Schengen zone and the free movement of people”, a common border police agency, and a united European asylum office. He also called for a united economic front, saying: “Our borders must ensure fair competition. We must sanction or forbid any companies in Europe that would seek to attack our strategic interests and our key values.” The President then referred to “environmental norms”, data protection, and fair taxation. 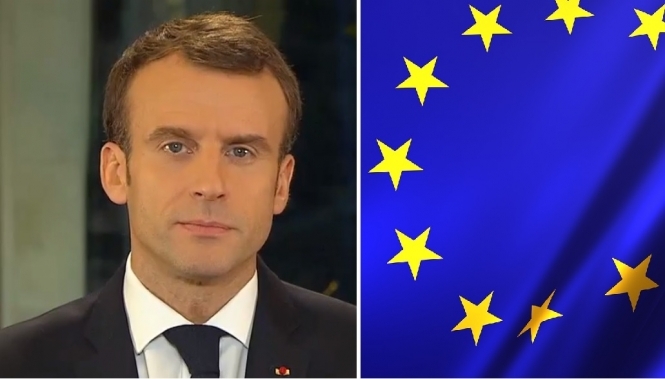 Mr Macron said that he did not want Europe to “submit to foreign powers”, and called for a ban on European political parties being supported by foreign funds. The President mentioned equal pay, and said that workers should receive the same levels of remuneration for the same job at the same company, regardless of location in Europe. He also referred to climate change, and said he would accept nothing less than a zero-carbon France by 2050, and a reduction by half of pesticide use by 2025. Mr Macron called for a “conference for Europe”, and suggested that a similar process to his national “Grand Débat” should be extended to the whole of the EU. This conference would allow the discussion of all topics, he said, including even the revisiting of existing treaties. The President added that the subject of Brexit was “at an impasse”, and said that France and Europe would never “shut the door on the British”. Mr Macron suggested that a “European security council working with the United Kingdom” could help Europe to make “joint decisions” when it comes to defence and border protection.